We live in a culture where faith and reason are often bizarrely pitted against one another. I met a young woman recently who told me about joining the Church as an adult. After having a powerful religious experience she had decided to take concrete steps towards becoming a Catholic, even though she assumed that she would have to leave her brain behind in the process. It was a sacrifice she was reluctantly willing to make because of her profound experience of God. To her surprise, when she began taking classes of religious instruction, she discovered that no such sacrifice was necessary. In fact, becoming a committed Christian caused her to use her reason more than ever. Thankfully, this young woman’s misconception was corrected, but there there are many others who are not as lucky as she and consequently never make it through the front doors of a church. It is for this reason that I think that Benedict’s thoughts on the relationship between faith and reason are extremely timely―and unfortunately, under-reported. What is particularly frustrating is that one of his most succinct and articulate discussion of the topic, his Regensburg Address, is famous not its substance but because in it he controversally made use of a fourteenth century quotation about Mohammed. However, leaving aside the perhaps impolitic choice to include this infamous quote, the speech is a magnificent reflexion on the relationship between faith and reason. 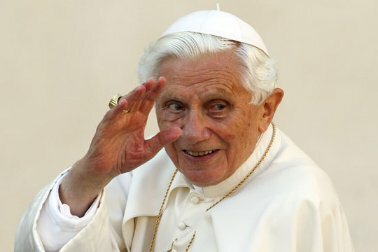 In the address, which was directed to faculty members at the University of Regensburg in Germany, Benedict warns of the danger of sundering reason from faith, stating that faith is not authentic unless it is in harmony with reason. He reiterates a favourite thesis of his: “The encounter between the Biblical message and Greek thought did not happen by chance.” This position is discussed more extensively in his 1968 work Introduction to Christianity, in which he argues that in Christianity, the God of Abraham, Isaac and Jacob truly became the God of the philosophers. Faith is not reducible to reason, but Benedict insists that religion without reason is not true religion at all. Clearly, one target he has in mind is religious fundamentalism, especially the forms that lead to violence, but his message extends to all people. A faith that checks its brain at the door is severely lacking, for God himself is the divine logos, who creates the world in accordance with Reason itself. Benedict further challenges the modern world to expand its conception of reason. In the Regensberg Address, he calls upon contemporary culture to broaden “the self-imposed limitation of reason to the empirically falsifiable” so that its “vast horizons” can be uncovered. If reason is restricted to the merely scientific, then it is cut off from its very ground: “Modern scientific reason with its intrinsically Platonic element bears within itself a question which points beyond itself and beyond the possibilities of its methodology.” Any attempt to circumscribe reason, is then, as Benedict believes, fatal. The modern tedency to covertly (or even unintentionally) baptise scientific theories as metaphysical foundations are one of the results of this error. For example, in the introduction to a volume summarising a conference on creation and evolution, Benedict points out that a “comprehensive theory of evolution, intended to explain the whole of reality, has become a kind of ‘first philosophy’”. This, he believes, is to have radically misunderstood reason itself, which certainly can understand the material world (and hence evolution), but must go beyond it to find its basis. His challenge is one that should, in theory, be amenable to our culture: open your minds! A second theme of Benedict’s thought that is even more under-discussed, and yet perhaps more important than the first, is hope. When his three encyclicals are mentioned, there is usually some commentary on the first and the third, but the second, Spe Salvi, is almost always passed over. And yet in this document, Benedict explores the aspect of human nature that literally drives everything that we do. He makes the simple but profound point that what we hope for determines how we live. In some way we want life itself, true life, untouched even by death; yet at the same time we do not know the thing towards which we feel driven. We cannot stop reaching out for it, and yet we know that all we can experience or accomplish is not what we yearn for. This unknown “thing” is the true “hope” which drives us, and at the same time the fact that it is unknown is the cause of all forms of despair and also of all efforts, whether positive or destructive, directed towards worldly authenticity and human authenticity. Benedict makes the simple proposal that we must return to placing our hope in God in an altogether authentic way. Because this means coming to love and know God through Jesus Christ, is is a radically outward-oriented kind of hope. This great hope can only be God, who encompasses the whole of reality and who can bestow upon us what we, by ourselves, cannot attain.… His love alone gives us the possibility of soberly persevering day by day, without ceasing to be spurred on by hope, in a world which by its very nature is imperfect. His love is at the same time our guarantee of the existence of what we only vaguely sense and which nevertheless, in our deepest self, we await: a life that is “truly” life. Christ, at the Father’s right hand, is not far away from us. At most we are far from him, but the path that joins us to one another is open. And this path is not a matter of space travel of a cosmic-geographical nature: it is the “space travel” of the heart, from the dimension of self-enclosed isolation to the new dimension of world embracing divine love. Yesterday, Pope Benedict XVI resigned. Perhaps one way to give thanks for his service of unity in the Church (c.f., Lumen Gentium, §23) would be to ponder these two great themes and seek to communicate them—or any other teaching you have found helpful for yourselves—more broadly. Often we complain that the true message of the Church is ignored in the modern world, and perhaps rightly so, but in the end, who will hear it unless we ourselves proclaim it (c.f., Rom. 10:14–15)?